This is Dee, for whom our orphan kitten fund was named. His name is actually D.L. (short for Damn Lucky!). In May of 1996, Natalie, a technologist at North Douglas Veterinary Clinic, saw him get hit by a cab and she rushed him to an animal hospital where they applied emergency measures to help save him. He was bleeding heavily from his nose and eyes and had gone into shock. Dr. Guernsey did a great job in stabilizing him and getting him through the night. The next day he was transferred to the clinic where Natalie worked. This is what he looked like. Dr Nightingale had to wire both his upper and lower jaws, remove his right eye and insert a feeding tube through his neck so he could be fed, as he would be unable to move his jaw for at least six weeks. He only weighed four pounds! After the surgery D.L. also needed to be neutered and have his ears flushed because they were full of mites. Natalie tried to locate an owner, but no one came forward to claim him. Likely he didn't have a family at this time. Natalie took him home and brought him to work each day. He had to be fed by syringe every four to five hours with a special food. Six weeks later a larger feeding tube was put directly into D.L. 's stomach to make it easier to feed him. It was the first of at least 20 that he went through! He had a tendency to chew and pull them out. D.L. adjusted well to life with Natalie and her other 6 cats. Eventually he weighed 12 pounds! He loved other animals and was always looking for someone to play with! The accident seemed to have left him without a sense of smell or a sense of typical cat behavior. He never did re-learn how to eat enough food to maintain normal body weight so Natalie had to continue feeding him four times a day through a feeding tube. Dee adapted well to the way he was fed and loved to hang out at the Veterinary clinic (he thought it was his clinic!). On November 12, 1996, Natalie moved and Dee got outside and disappeared. The local TV station even did a story on him! After a month everyone thought he was lost forever... then a miracle - just before Christmas, on December 18th, the pound called and Dee was returned home! He had lost six pounds and was very tired and had some minor injuries, but he was happy to be home! In February of 1997, a specialist (Dr. Lindell Lovett) came to Victoria to perform surgery on Dee's palate. It still had a hole in it due to the accident, and water would go up into his nose and lungs when he drank. The surgery was successful! Dee was now a happy kitty! 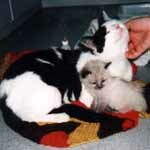 Dee was there at the beginning when Natalie started caring for the first of "Dee's orphan kittens". He absolutely adored kittens and luckily, most kittens seemed to think he was just great! As more and more orphan kittens and cats were brought in, Natalie recruited a corps of volunteers to help. Volunteers provided foster care for the kittens and cats, and kind-hearted people began to make donations for their care. At this point an official Canadian non-profit society was formed and was aptly named Dee's Orphan Kitten Fund. Sadly, Dee passed away from kidney failure at the approximate age of 10 years old on August 18th, 2005. He died in his mom's arms, knowing he was very much loved. 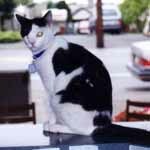 His spirit will continue to live on and help watch over all the stray cats and kittens that his charity tries to help. Please remember him by giving an extra pat or cuddle to your special friend today.